28 | TH E M R EP O RT FEATURE statistic between the FICO Score pre-NCAP and post-NCAP. The K-S statistic is commonly used to evaluate a credit scoring model's predictive strength, with higher values indicating a more effective risk prediction. The exceptionally small negative K-S difference values in Figure 1 indicate a very modest decline in risk prediction between the pre-NCAP and post-NCAP FICO ® Score tied to the removal of impacted public records. The results from each CRA is pre- sented in one of three separate columns. NCAP did not have any impact on the predictive strength of FICO ® Score 9 for mortgage originations for 2 of the 3 CRAs and a slight decrease of 0.2 per- cent at one CRA. Similarly, there was virtually no perceptible impact to the FICO Score odds-to-score relationship, as shown in Figure 2 for FICO Score 9. In this chart, FICO graphed the fitted odds-to-score relationship of FICO Score 9 pre- NCAP and compared that to the fitted odds-to-score relationship of FICO Score 9 post-NCAP. In addition to very minimal predictive impact, there is no material impact to score distri - butions pre- and post-NCAP. 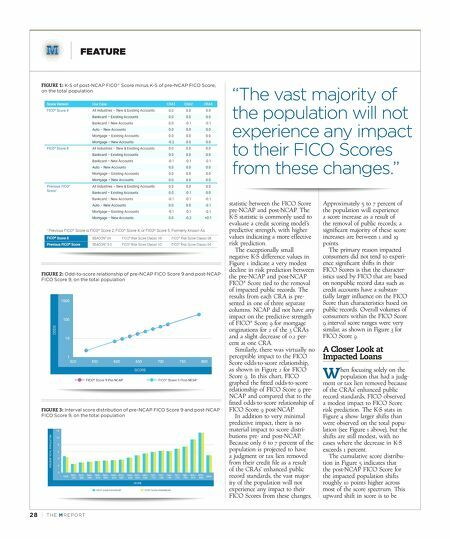 Because only 6 to 7 percent of the population is projected to have a judgment or tax lien removed from their credit file as a result of the CRAs' enhanced public record standards, the vast major - ity of the population will not experience any impact to their FICO Scores from these changes. Approximately 5 to 7 percent of the population will experience a score increase as a result of the removal of public records; a significant majority of these score increases are between 1 and 19 points. 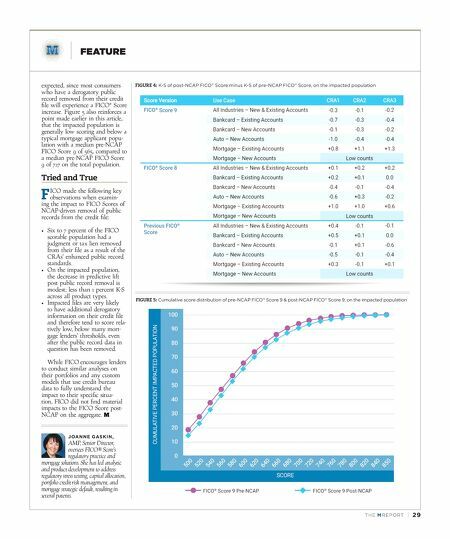 The primary reason impacted consumers did not tend to experi- ence significant shifts in their FICO Scores is that the character- istics used by FICO that are based on nonpublic record data such as credit accounts have a substan- tially larger influence on the FICO Score than characteristics based on public records. Overall volumes of consumers within the FICO Score 9 interval score ranges were very similar, as shown in Figure 3 for FICO Score 9. A Closer Look at Impacted Loans W hen focusing solely on the population that had a judg- ment or tax lien removed because of the CRAs' enhanced public record standards, FICO observed a modest impact to FICO Score risk prediction. The K-S stats in Figure 4 show larger shifts than were observed on the total popu- lation (see Figure 1 above), but the shifts are still modest, with no cases where the decrease in K-S exceeds 1 percent. The cumulative score distribu- tion in Figure 5 indicates that the post-NCAP FICO Score for the impacted population shifts roughly 10 points higher across most of the score spectrum. This upward shift in score is to be FIGURE 1: K-S of post-NCAP FICO ® Score minus K-S of pre-NCAP FICO Score, on the total population FIGURE 3: Interval score distribution of pre-NCAP FICO Score 9 and post-NCAP FICO Score 9, on the total population FIGURE 2: Odd-to-score relationship of pre-NCAP FICO Score 9 and post-NCAP FICO Score 9, on the total population "The vast majority of the population will not experience any impact to their FICO Scores from these changes."